My edition: paperback, published on 2 October 2014 by Hot Key Books, 267 pages. Description: In Beacon Heights High, Nolan Hotchkiss is king. His charm, wealth and good looks are deceptively seductive, and many are the students whose lives and reputations have been ruined by it. All while Nolan continues to reign, unquestioned and undisrupted. Until now, that is. 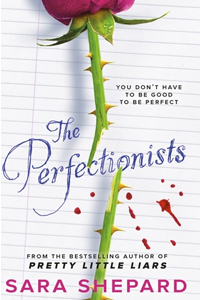 The Perfectionists follows the same winning formula author Sara Shepard uses for her extremely popular Pretty Little Liars series; a group of girls who couldn't be more different are thrown together over a common secret and murder and mayhem ensues. Despite the similar set-up, the story is vastly different because for once the leading ladies are not the rich and glamorous ruling their school, which was the case for both Pretty Little Liars and The Lying Game, but a group of girls that each carry a load of baggage with them; soccer-obsessed Caitlin, music prodigy Mackenzie, beautiful Ava, the emotionally and physically scarred Parker and her best friend Julie, a popular girl who isn't quite what she seems. I don't know how Sara Shepard does it, but she manages to write several of her hugely addictive young adult mystery novels each year. I've devoured all of the Pretty Little Liars and The Lying Game books and while the former should've run its course years ago and I don't find the stories quite as interesting as I used to, I cannot stop reading each new book soon after its release. Shepard has a flair for creating great characters the reader can identify with and placing them in gripping plots that are filled to the brim with outrageous secrets, murders and crazy twists, and with The Perfectionists she's got another winning series on her hand. Shepard's expertise in the genre is showing as the characters in her latest work are more diverse and interesting than in her previous YA novels. It's clear that each of the five main girls has a lot of backstory that is yet to be uncovered, providing plenty of interesting storyline strands for the wealth of sequels that are undoubtedly to come over the new few years. The book also felt more mature and thought-out; for once several of the plot twists caught me by surprise and they were exceptionally well planned, with definite hints to the mysteries of the great Agatha Christie referenced throughout. My only complaint, though that word is a bit harsh, I have about this book is that it's clearly set up as a first in a much longer series. This means that it merely serves as an introduction to the characters and storylines and few answers are given to any of the questions that arrive in this first installment. It's a great way of pulling the reader in and ensuring that they'll want to pick up the next novel as soon as it's published, but personally I would've liked to have been rewarded with a sneak peek to some of the answers, rather than being left dangling with a blatant open ending. Still, I have come to expect it from Shepard's novels and other than that I thought this was a strong start to what surely will be a very successful new venture for the Pretty Little Liars-author. Many thanks to Hot Key Books for a copy of the novel in exchange for an honest review.